Warm up with mannequins pass set recieve spin & support. Playing through. Keep Ball 5 v 2. decide when to play through best. pass best option & support. 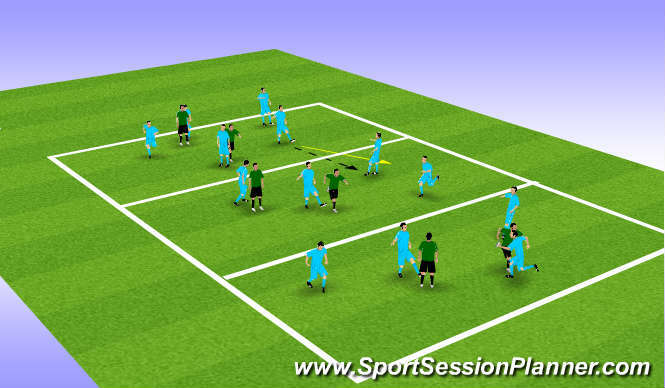 player who passes into next section follow pass to make overlead of 5 v 2 again. progression person passes stays & third man supports group. recieving. passing, recieving,running with ball. turning with ball. passing and moving. i.e one twos, overlaping support around ball keeping width. speed endurance short sharp runs. communication, self control, concentration. positive mental attitude to mistakes & ball play. Poor quality touch under pressure, vision to play free reciever keeping with all to close to ball, got better but will need to repeat session again.